Imagine an eerily quiet town in North Africa, set at the edge of the Sahara Desert, right in the middle of an impossibly narrow peninsula that juts out into the Atlantic Ocean. Imagine a harsh and constant 40 kmh wind blowing into your face, with sand flying around, caught up in the gusts, and going straight into your eyes and mouth. Looking around, you find empty intersections and very few vehicles on the streets, and you quickly notice that there’s barely any people walking around either. When someone does glide by in the distance, in their traditional hooded robe or cloth covered face to protect themselves from the elements, you wonder where the other people could possibly be. Imagine a town with seemingly little connection to the outside world, as if it were located on an entirely different planet altogether. Welcome to Dakhla, Western Sahara. Why Would I Travel to Dakhla? The reason I decided to travel to Dakhla, Western Sahara (or Moroccan Sahara depending on who you talk to) was a random one. I was in Casablanca, Morocco and I had 8 days before I needed to be in London to meet up with my girlfriend. I searched for flights to all kinds of cities and suddenly, I saw Dakhla on the map. It was a relatively short distance away by plane, the fare was quite inexpensive and I knew absolutely nothing about the place. It seemed like the perfect destination and I booked my ticket. 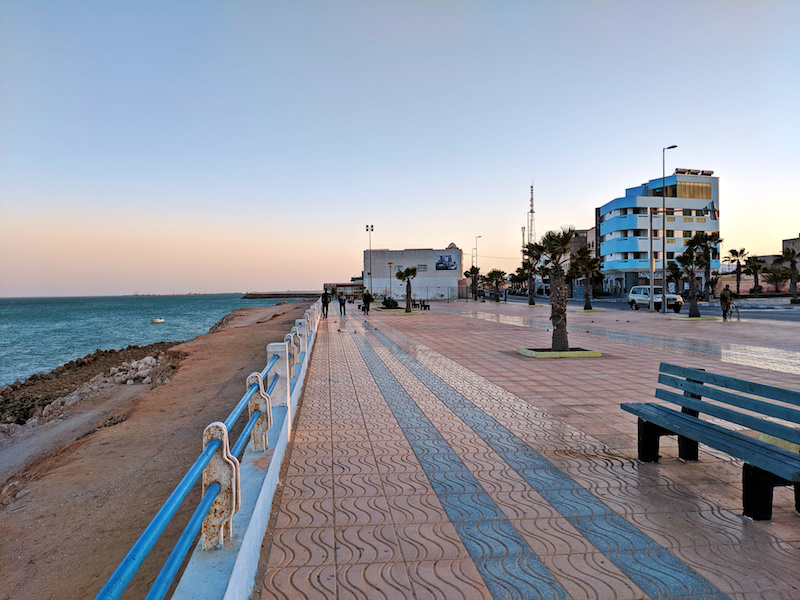 On my first afternoon in Dakhla, I found myself sitting on a bench in the middle of an empty, yet brand new, concrete boardwalk along the water. 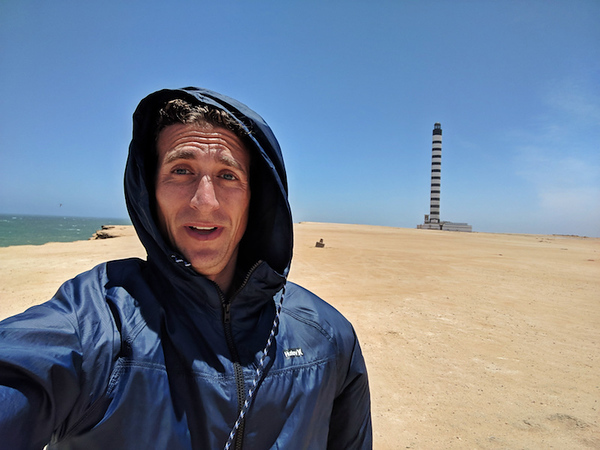 I zipped up my windbreaker and stared out in front of me, across the Dakhla Bay, with the faintest view of the mainland far away in the background. After 10 minutes, a man walked by, we nodded, and he sat down at another bench. The wind pounded my head. I sat in disbelief at how little activity was around me. Where were the people? What was I supposed to do here? And I started to wonder if my decision to travel to Dakhla was a good one. Time passed, the wind howled, the sun began to set. And before long, perhaps as the sky turned from blue to bright pink, I began to perk up. I don’t know what triggered it exactly but I soon made an important realization that would change my perspective. It’s actually quite exhilarating to not know. There’s something special about having no clue whatsoever about where you are and what there is to do. 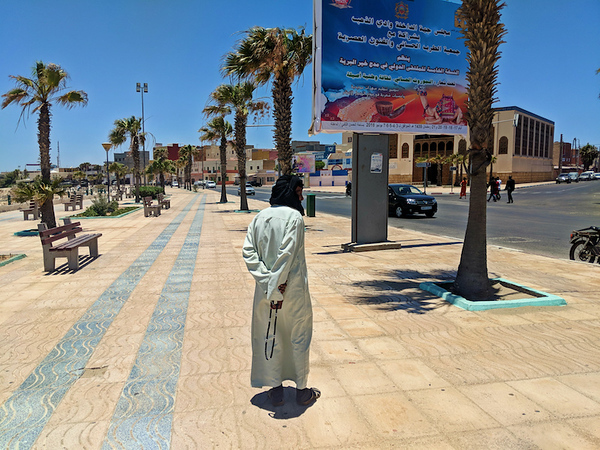 If I was going to make the most of my time in Dakhla, I needed to find the people, I needed to bust out some horrendous French and try to communicate, I needed to start asking questions and creating my experience. What I really needed was to go back in time 15 years, to those days when we didn’t have access to all kinds of information and had no choice but to show up in a new city without knowing what to expect. Sure, I could have looked up some information about Dakhla and its surroundings but I didn’t really have time and there really isn’t that much information out there anyway. Prior to my trip, all I had done was book a room. And so it went. I transported myself back to the good old days. I asked the guesthouse owner for recommendations. I talked to the woman in the bakery and the man at the travel agency that I had mistaken for a tourism office. I tried my best to communicate, in my horrendous French and so-so Spanish, with the waiter at the small local restaurant and with the man selling fruit on the side of the road. And in the end…I got nothing. Nada. Rien du tout. There’s a lighthouse (that was closed), a market (that was quite empty) and a main square that was as desolate as could be. The beach in town was all torn up and under some kind of construction. There were tea shops but they were almost all without any tea drinkers. The experience was raw, and fascinating in its own way. It was an old school trip straight into the unknown. Is Dakhla Worth a Visit? By Day 3, I had a routine. I woke up in my comfy room at the Guesthouse Dar Rio Or and went upstairs to the owner’s apartment. Here they served me a large breakfast of coffee, eggs and several kinds of bread, which I ate on my own of course as I was naturally the only guest. Two hours of work on the little balcony off my room. Three hours of roaming around town, an afternoon rest and an evening wander along the water, with a simple dinner at one of the simple eateries. On paper, and based on my description above, it would seem that there is little reason to travel to Dakhla. …when’s the last time you’ve been in a city and you were the only traveler there? How often can we visit a place that is completely without tourism infrastructure or tourism influence and is as real as it gets? 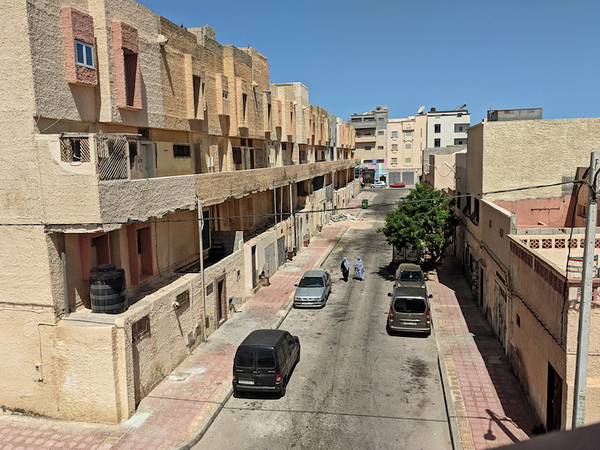 Dakhla is eerily quiet. The wind really does hurt. You’ll inhale a good amount of sand, too. You’ll spend a lot of time sitting on benches, sipping tea and pondering life, not because you’re in the middle of a spiritual awakening but because, again, there is nothing else to do. …you won’t want to leave. Okay, I did want to leave, but I was definitely happy I visited! To be outside the normal influences of tourism was invigorating, challenging and rare. And as a result, such an experience can only be positive. Planning a Trip to Dakhla? 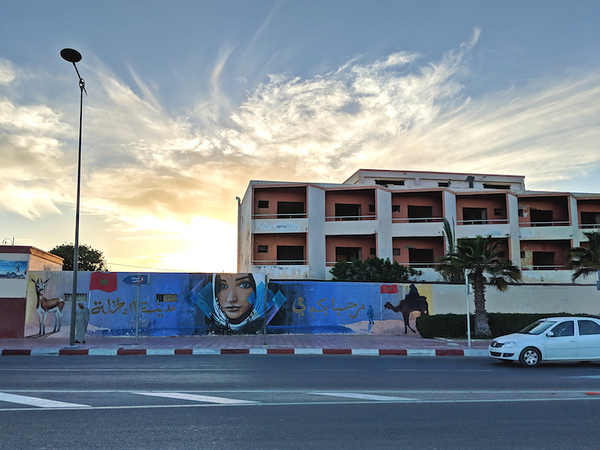 Here’s my Quick Guide to Dakhla post where I talk about entry/visas, safety, accommodation, where to eat, what to do and more. If you plan to travel to Dakhla and have any questions, just let me know! Thank you for this wonderful description. That’s the way I experienced it, too – and I loved it. Although I missed the wind and the sand in the eyes. Would like to add that there are quite good budget accommodation options, too. Thanks again. Its fascinating how you bring us to another part of the world “The unknown and unseen”. We all read about famous places but little is written about places like Dhakla. The anonymity lets you explore and brings out a different perspective. I enjoyed reading this post. You’re a gifted storyteller. Have you ever considered writing a book? Dakhla seems a really special and rare destination to visit. So empty indeed, nearly desolate. Strange they even have an airport, hotels, and taxis. I think I’d love to once get to the city like that, just to feel a special only tourist around. Probably I’ll also combine it with my trip to Morocco. If I decide to go, how long should I stay there not to get bored? 8 days seems too many, right? I admire your spontaneous and adventurous self. Keep posting. Love this account of being somewhere that has yet to be engulfed with tourism. We travelled to a few villages in the remote areas of countries like Bosnia and Albania that were as if cut off from the rest of the world. It’s definitely an education and you feel privileged to be part of their world for a while. More often than not – no signal so you are forced to take a step back – just as you describe. Sounds like a place you can rest assured that nobody will ever find you, that in itself must feel refreshing if only for a short time! I love how you do the world. Your authentic way of being and openness. Thank you for inspiring the rest of us to be open to the unknown and to embrace life. I’m headed to Bratislava in October. I recently re-read your post from your time there. I’m still smiling. I can’t wait until one day path crosses yours. I believe it will! Thank you for reading Sharon. Enjoy your time in Bratislava as I’m sure you will. I love when these smaller, lesser visited destinations end up on travelers’ itineraries! And yes, I look forward to meeting up somewhere out there. Keep me posted with your travels! Hmm we are in fez right now, in morocco for 2 months w no plans. Very tempted to go to dakhla. Spent a wk in meknes. Hey Debbie – If you want something really unique, it’s worth a visit! Definitely not a standard destination but that desert and mainland coast is something really incredible. This is awesome! And by far my favorite way to travel. Just pick a destination and go, don’t plan, just show up and see who you meet and where you end up. Sounds incredibly surreal and pretty amazing. Probably a bit near wracking at first, but an interesting time seems to have been had. Hey Barret – It is a great way to travel. It does feel strange at first when you are completely engulfed by the unknown, with little information to turn to in order to get your footing. But it doesn’t take long to figure things out step by step and usually, the result is quite rewarding. This is really cool. It shows how incredibly small the world is we live in. What are some places you would suggest if any of us ever have a chance to make it out there.